On Monday, May 3rd at noon ET/9am PT, the M&M’s Most Colorful Fans Facebook Page will be hosting a live video chat with Kyle Busch, Denny Hamlin and Joey Logano to kick off the launch of the all-new M&M’S Most Colorful Fan Virtual Tailgate Zone on NASCAR.COM. Fans will have the chance to submit questions for the drivers during the chat. Who: The M&M’s Most Colorful Fans Facebook Page is proud to host a live video chat with Kyle Busch, Denny Hamlin and Joey Logano. 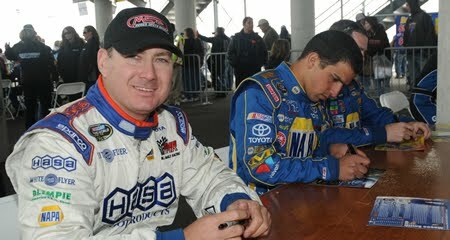 Fans will have the chance to submit questions for the drivers during the chat. What: The live chat kicks off the launch of the all-new M&M’S Most Colorful Fan Virtual Tailgate Zone on NASCAR.COM. Fans can visit www.NASCAR.COM/MostColorfulFan for exclusive, fan-focused content including news, tailgate recipes and opportunities for fans to connect and share their passion for NASCAR with each other via posts, photos and videos. In addition, 2010 marks the third year of the M&M’S The Most Colorful Fan of NASCAR Contest, giving fans the opportunity to show their colors by uploading photos to www.NASCAR.com/mcf starting on Memorial Day. What a super opportunity - I will be there. It was even louder than usual at our home as the last laps of the Nationwide race played out this past weekend at Talladega. I had kept a close eye on my son’s friendly adversary, Johnny Borneman III since he took the green flag from thirty-first position. Borneman, driving the #83 Dodge, had maneuvered his way steadily forward and positioned himself well for the “Green, White, Checker” finale. I was screaming at the television like a fool as he took the checkered flag in fifth place. 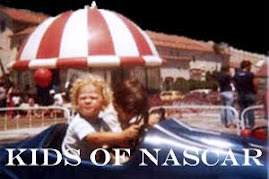 Moses and Johnny first raced against each other in the San Diego Karting Association as children. In 1991, Moses was the Junior Sportsman Class Champion and finished second in Junior Piston Port division. Johnny was the 1991 Junior Piston Port Class Champion and finished third in the Junior Sportsman division. Most recently, Moses and Johnny competed in the K&N Pro Series West Championship. It is wonderful to see the all the hard work and dedication bear fruit. Congratulations to Johnny Borneman and entire team for a job well done. Success doesn't come easily in the Nationwide Series, but John Borneman III proved that sometimes it isn't how much equipment or resources you have, but how much talent. Borneman posted his first career top-five finish in the Nationwide Series this past weekend at Talladega after qualifying 31st in the No. 83 Dodge. Borneman has been around NASCAR a long time. He hails from Ramona, Calif., and is a NASCAR K&N Pro Series West veteran. Both he and his father, John Borneman Jr., competed in the NASCAR Winston West Series and his father was a track champion at Cajon Speedway in San Diego. The most impressive part of his success was Borneman did it with limited resources. He only had four guys on his pit crew servicing his car at Talladega. After the race, during an emotional interview, Borneman said, "It's one of the greatest days of my life." Borneman joins a group of drivers that have climbed the developmental-series ladder and now have found success on the national level in the Nationwide Series: such as two-time series champion Kevin Harvick, a former NASCAR K&N Pro Series West champion; 2008 Nationwide champion Clint Bowyer, a former NASCAR Whelen All-American Series track and regional champion; and Joey Logano, a former NASCAR K&N Pro Series East champion. All three joined Borneman in the top six at Talladega. Borneman, 33, has spent 10 years as a full- and part-time driver in the NASCAR K&N Pro Series West, where he has three victories and a pole. Prior to Sunday's race, his career highlight was winning at Evergreen Speedway in Monroe, Wash., in 2006 -- the track where his father recorded his only series victory 28 years before. However, a mad dash through a myriad of cars tangled in a last-lap accident brought the signature moment in his racing career. Borneman was 18th with 10 laps to go, barreled through a top-10 group that included six double-duty drivers and three series-only regulars on that thrilling final lap. "I think to do what he did at Talladega was pretty remarkable. It was impressive," said Ken Clapp, a senior consultant for NASCAR who tirelessly promoted races on the West Coast for nearly six decades. "I think it's terrific that he could go back there and do so well with what they had. His dad told me they did not go back there with much to work with. They were short on funds. They only had four guys, plus him [Johnny]. It was a big emotional win for the family. It was a big shot in the arm to have this happen. It was well deserved. "John and other [former] Winston West competitors of that era lived their dream by competing in combination races with what was then the NASCAR Winston Cup Series, rubbing fenders with the likes of Richard Petty, Bobby Allison and Cale Yarborough. "Johnny's now fulfilling that family dream by taking the opportunity to race on a national level in the NASCAR Nationwide Series." It was just the 17th race of Borneman's series career, and his third this year. He failed to qualify at the season opener at Daytona and also at Las Vegas. In the two races where he did qualify, he finished 43rd Fontana due to a transmission issue and 36th at Phoenix as a result of an accident. His career-best finish had been 16th at Iowa in 2009. Racing isn't Borneman's only occupation. In order to fund his dream, he holds a full-time job as a plaster and scaffold foreman. 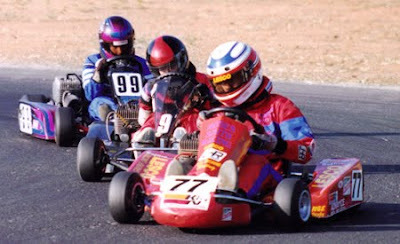 His racing career began in go-karts from 1989-94. He moved on to late models on road courses and ovals before making his NASCAR K&N West debut in 2000. For the 34-year-old driver who won the series’ 2008 and 2009 Most Popular Driver Award in an online fan vote, the Jimmie Johnson Foundation 100 is time to get his third full-time season in the NASCAR K&N Pro Series West under way. 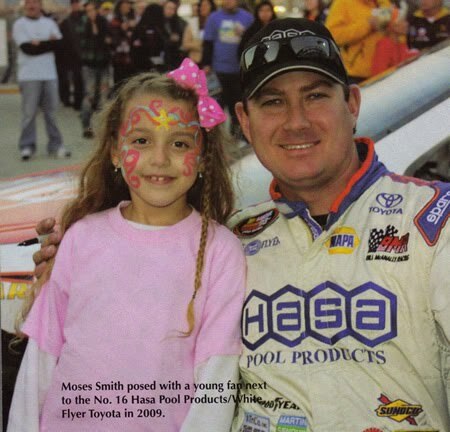 Driving the No.16 HASA Pool Products/White Flyer Toyota for Bill McAnally Racing, Smith finished seventh in the 2009 point standings, posting five top-five and nine top-10 finishes in 13 races. In 2008, he finished sixth in the standings with three top-five and 10 top-10 finishes. He’s ready to improve on those results. NASCAR Sprint Cup Series 2009 Raybestos Rookie of the Year Joey Logano won that race, with Smith finishing 30th after finding trouble on lap 188 at Toyota Speedway in Irwindale, California, a few months ago. This week, he’s at home in Phoenix, where he loves to race. Smith finished 16th in the Jimmie Johnson Foundation 150 in 2009, and seventh in 2008. The race is a bit shorter this year, running only 100 laps. That is something Smith admits may change every teams strategy in this weekend’s race. In the K&N Pro Series West, teams may fuel the car and change two tires on a pit stop, but, to change the other two tires, the cars must make a second pit stop. With the race dropping from 150 to 100 laps this year, Smith said changing left-side tires probably will not happen. “If the race was 75 to 80 laps, we definitely wouldn’t stop for tires, and we’d be watching our fuel very closely-counting the caution laps and figuring from there,” Smith said. “But, at 100 laps, we definitely have to stop for fuel. 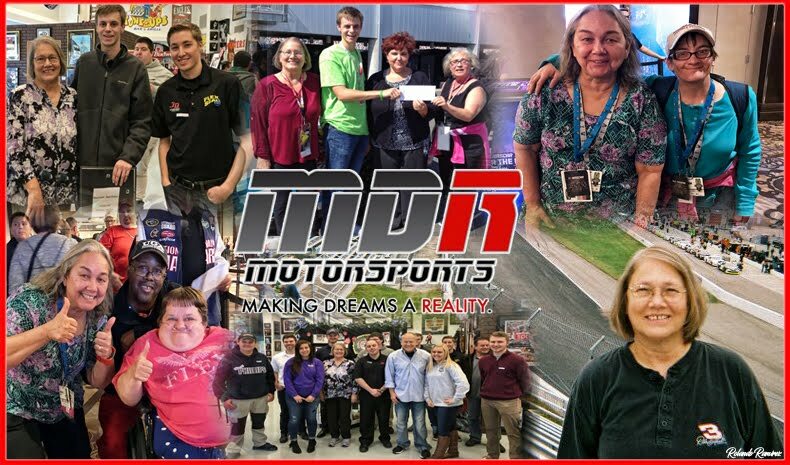 With the tires, if were not among the leaders, well be watching what they do and decide from there.” Many racers have goals of making a profit and paying the home mortgage with the race proceeds, but the reality is that the majority are not able to do that. Smith makes his living building race cars at his Moses Smith Racing shop in Tempe, where the specialty is building and racing cars for Formula Mazda competition that has produced upper-level NASCAR drivers like Scott Speed and Michael McDowell. As the 2002 Star Mazda West Coast champion, the 2001 Star Mazda West Coast Rookie of the Year and the 2001 SCCA Class champion, Smith has the resume to grab the attention of major teams and sponsors. But, until that happens, he’s happy with his race shop, even though business is a littler leaner that he’d like. Fixing grills may not happen, but Smith definitely would like to toast the competition at Phoenix International Raceway. Smith loves his hometown of Phoenix, of course, but he also relished the change to get to the bigger tracks-Phoenix International Raceway is the largest track on the K&N Pro Series West schedule. Speed entices every race car driver but, for Smith, another unique facet of the Desert Jewel puts a special sparkle in the racing. Smith still remembers his first K&N Pro Series West race at Phoenix International Raceway. 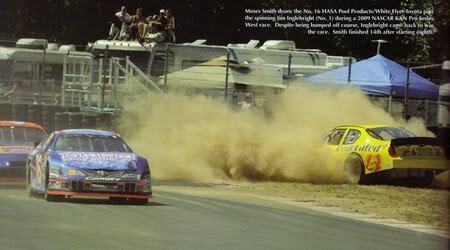 It provided his most memorable moment in NASCAR. Race fans who enjoy the grassroots racing action of the NASCAR K&N Pro Series West in Thursday’s Jimmie Johnson Foundation 100 are accustomed to waiting a full year for the series to return to the Phoenix International Raceway oval. This year, they’ll get a double dose. 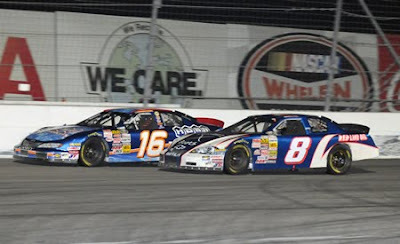 A longtime contributor to the history of the NASCAR K&N Pro Series West, Phoenix International Raceway has secured the season finale and will host two races on the regional tour in 2010. The new autumn race for the NASCAR K&N Pro Series West at Phoenix International Raceway will take place November 11, kicking off PIR’s traditional Semi-Final weekend in NASCAR’s Chase for the Sprint Cup. Two-time defending K&N Pro Series West Most Popular Driver of the Year Moses Smith resides in nearby Tempe, and drives the No. 16 HASA Pool Products Toyota for Bill McAnally Racing. Smith believes the extra race at Phoenix International Raceway is a benefit to many in the series. “First of all, with it being my home track, it’s obviously awesome. It’s nice to run in front of the hometown crowd,” Smith said. “It’s great for my sponsor, HASA Pool Products. There are a lot of pools in Phoenix, so we get a good turnout from them. Just the fact that it’s in Phoenix is pretty darn cool. Since Cale “Yarborough’s victor in the tracks first series race in 1977-an event that followed the drivers second Sprint Cup Series championship by one week- the K&N Pro Series West has competed 33 times at Phoenix International Raceway. International Raceway hosted two events in the series each year from 2003 to 2006. NASCAR K&N Pro Series West winners at Phoenix International Raceway include Richard Petty (three), Bobby Allison, and Ken Schrader, who leads all drivers with four victories in the series at the track. Current Sprint Cup Series drivers Joey Logano and David Gilliland are other past race champions in the Valley of the Sun. And, West Coast natives Kevin Harvick and Kurt Busch are among the drivers to have traversed the noted feeder division on the way to Spring Cup Series success. NEWTON, Iowa - Iowa Speedway’s fourth annual NASCAR K&N Pro Series East/West Challenge race on Sunday, May 23rd will benefit soldiers wounded in Afghanistan and Iraq, as well as raise funds to help Jasper County World War II veterans visit the Washington, DC memorial dedicated to the 20th century’s last great global conflict. The track’s ‘Salute to Veterans’ event will feature special $20 race tickets that have been made available to two veterans support organizations, Operation First Response and Jasper County Honor Flight, through the Iowa Speedway Foundation. Ten dollars of each special race ticket sold will be retained by the veterans’ groups to fund their charitable work. In addition, hundreds of veterans from all military eras will be recognized during Opening Ceremonies for the race, including a large contingent of Iowa National Guard deploying to Afghanistan in July. Operation First Response (OFR) was established to provide critically ill and wounded military from Iraq and Afghanistan with financial and emotional assistance. To date, OFR has extended a helping hand to over six thousand wounded veterans across the country and over 100 in Iowa. Based in Culpepper, Virginia, OFR has volunteers across the country, with P. J. Sesker-Green of Grimes, Iowa serving as director of marketing and public relations. Sesker-Green joined OFR in 2006 after her nephew, Sgt. Daniel Sesker, was killed in action in Iraq. The Jasper Honor Flight committee was founded by Jasper County Treasurer Doug Bishop, and has been raising funds for several months to send a group of Jasper County World War II veterans to Washington, D.C. to view the monuments. Currently Bishop has 37 veterans and 13 guardians — either other veterans or medical caregivers — scheduled to fly out of Des Moines on May 27. Operation First Response volunteers will be selling the special Iowa Speedway race tickets at the following places and dates: Dewey Ford in Ankeny, Saturday, April 24th from 10:00 am to 4:00 pm; Stew Hanson Dodge City in Urbandale, Saturday, April 24th from 12:00 noon to 4:00 pm; Ron’s Dawg House in Des Moines Tuesday, April 27th from 5:30 to 9:00 pm; The Game Bar & Grill in Urbandale, Saturday, May 1st from 2:00 to 8:00 pm. 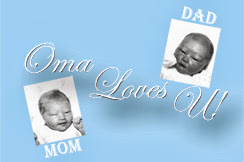 OFR’s tickets may also be purchased through the mail by sending a Cashier’s Check or Money Order to: OFR, c/o P.J. Sesker-Green, P.O. Box 742, Grimes, Iowa 50111, along with a self-addressed, stamped envelope. Jasper Honor Flight’s race tickets are available Monday through Saturday after 3:00 pm at the American Legion Hall, 1101 West 4th Street South in Newton, and at the Aleya Spa & Suites and Forbes Quick Print, both located on the Newton Courthouse Square. Interested parties are encouraged to call the Newton American Legion at 641-792-3353 for more information about the special Jasper Honor Flight NASCAR race tickets. Located 30 miles east of Des Moines on Interstate 80, just south of Exit 168 in Newton, Iowa Speedway is entering its fourth full season of operation in 2010. Additional ticketing information and complete event schedules are available at the track’s official website or by calling the toll-free number, 800-RUSTY-GO (800-787-8946), 9:00 am to 5:00 pm week days (Monday through Friday), and 9:00 am to 3:00 pm on Saturdays. Moses Smith, NASCAR K&N Pro Series West driver and the Hasa Crew spent race day at the Phoenix International Raceway in frustration. The race vehicle was tight all morning and nothing they did would fix the problem. However, after a disappointing qualifying position of twenty-fourth out of the thirty-three car field, Moses and Crew Chief Mario Isola were confident that the car would come to life as the track cooled. “After the #16 Hasa Pool Products Toyota Camry being extremely tight during both practices, we decided to completely change the set –up for qualifying. Imagine my surprise when I had an extremely loose car to qualify with!” chuckled Moses. The Hasa Pool Products Car marched forward as soon as the Green Flag flew. By lap 70, Moses was running in the top-ten and the team knew that their predictions were correct. On the restart with eight laps to go, Moses started in the eight position. Unfortunately, a three car tangle in turn three set-up a green-white-checkered situation. Moses got an excellent restart and by the white flag lap had driven his way into the sixth position. 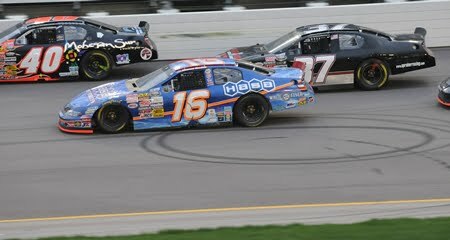 Suddenly two cars spun in front of the #16 Hasa Pool Products Toyota Camry. Moses was able to avoid the spinning vehicles only to be hit by the two cars behind him. The crash was so intense that the Hasa Emblem from his suit was etched into his left arm. Moses was checked and cleared by the infield medical personnel with severe bruising including a bruised rib. Moses wants to give special recognition to one of the newest sponsors, on the #16 Toyota Camry. Blimpie, America’s Sub Shop, increased their support of Moses’ racing in 2010. Moses was able to stop by Blimpie’s corporate headquarters in Scottsdale, Arizona with the race car on Wednesday and give everyone there an up close look at the car. “My visit at Blimpie's was exciting. . “It was great to have the car out there for the employees and associates to check out the car, especially for those who weren’t going to make it to the race” Moses expressed. On race day, Blimpie’s provided the crew with delicious sandwiches . They were also able to take advantage of the race being in their hometown by handing out Blimpie seat cushions and coupons for deli-fresh sandwiches to the #16 Hasa Pool Products fans. The next NASCAR K&N Pro Series West race will be held at the Iowa Speedway on May 23th. This race will be in combination with the NASCAR K&N Pro Series East and promises to be exciting and competitive. For more information on Moses Smith, please visit www.mosessmith.com. You can visit our sponsors’ websites at www.hasapool.com, www.whiteflyer.com, www.blimpie.com and www.tcitransportation.com. At The Track - Jimmie Johnson Foundation "100"
Tweeting The Jimmie Johnson Foundation "100"
1. Leave a tweet using the #MosesRace hashtag. Your tweet will automatically be posted to the live blog also. Tweets will appear in the live blog almost immediately.